Silver Dollar City is one of Branson attractions that is so unique in many ways. While the beautiful theme park, with features of many thrilling rides, great food and atmosphere are all distinct, what really makes this place so unique are the demonstrating craftsmen. The unselfish talent that these craftsmen are shown is so appreciating and worth the price of admission alone. There’s no other place that you can watch a woodworker carve life-like wooden figures or see a glassblower create delicate works of art or a candy maker craft incredible edibles right before your eyes. Silver Dollar City maybe famous for entertaining visitors but this beautiful place also offers educational opportunities and capture their visitors’ imaginations, and the live craft demonstration do just that. You’ll be amused when children come to know that glass pitchers, cutting boards, leather goods and ceramic pots aren’t just seen in store – they see how they’re handcrafted from raw materials by the skilled artisans. Visitors to Silver Dollar City can have the chance to purchase the products made in these public demonstrations in shops throughout the park. Why not take home a bit of the creativity and pioneering spirit that made America and Silver Dollar City so unique. The following artisans can be seen displaying their crafts at Silver Dollar City from March 14 through January 1. Frank Capps is a master baker that you can see displaying his skill as a baker at Sullivan’s Mill at Silver Dollar City. Frank creates daily delicious cinnamon bread and more. He grew up on a farm near Poplar Bluff, Missouri, where his family raised cotton and other crops. Frank has had many jobs in his life time. He’s been a carpenter in Colorado, owned and operated mobile home parks and was DJ “Country Frank” on WBNI in Booneville, IN. Frank and his wife had been vacationing in Branson for many years before they decided to move here in the mid 1990s and he found Silver Dollar City. During his stay at Sullivan’s Mill, he was trained by Wayne Adams to grind wheat and corn on the old water-operated grist mill in March of 1997. That same year of November he baked his first loaf of bread, and has been baking ever since. Frank said that baking at Silver Dollar City is one of the most fun things he’s ever done. He made a lot of lifelong friend here. Frank likes the family atmosphere that he enjoys at Silver Dollar City. At Sullivan’s Mill, you’ll notice a poetry by Frank that’s hanging on the walls. Master Craftsman Warren Cook is a furniture maker that creates home furnishings of good quality and beauty at Silver Dollar City’s Heartland Home Furnishings. Warren had a passion for craftsmanship. During his childhood days, he began experimenting with different materials, building anything he could with his own two hands. By just crafting small picture frames, it quickly grew into crafting intricate furniture sets. In 1990, Warren turned his passion into a career. When he learned an available position at the Heartland Home Furnishings at Silver Dollar City, he visited Branson and applied for the job immediately. Several decades later, Warren still enjoys every moment. In that traditional 1880s style shop, Warren has the opportunity to work with traditional tools that are not typically found in furniture shops anymore. Some tools used in the shop are from the 1880s, allowing him the freedom of hand crafting and design. Warren makes many kinds of furniture sets for the shop including his favorite, bedroom pieces. He also makes bookcases, cabinets, entertainment and computer tables. Warren had a favorite memory at the park when he was awarded the honor of Master Craftsman. Master candy maker June Ward can be seen at Brown’s Candy Factory at Silver Dollar City as she creates delicious candies. A native of the Ozarks, June Ward was born at Lake of the Ozarks. She was raised in Galena and Reeds Spring, Missouri. When June learned from her friend Ted Miller recruiting people to work at Silver Dollar City, she decided to help him during the busy fall crafts festival. Candy making is usually demonstrated in front of guests, and it’s ideal for June as she has a pleasing personality. June always approaches her craft with humor and great appreciation for the art of candy making. She is dedicated to share her knowledge with guests and new candy makers as well. For the young people who work in the shop, she has a genuine affection for them. Many come back year after year until they graduate from school. When they found new job they keep in touch, and bring their families back in to meet the crew. June learned the craft of candy making from Paul Davis and Paul Whitmer, who worked at Silver Dollar City. She was also taught on how to make chocolates by Flossie Inmon, from the Davis Candy Company. All of them had made candy for the majority of their lives. June also remembers working side by side with Hazel Muray, aka Ma Brown, for whom Hazel’s Blown & Cut Glass was named. 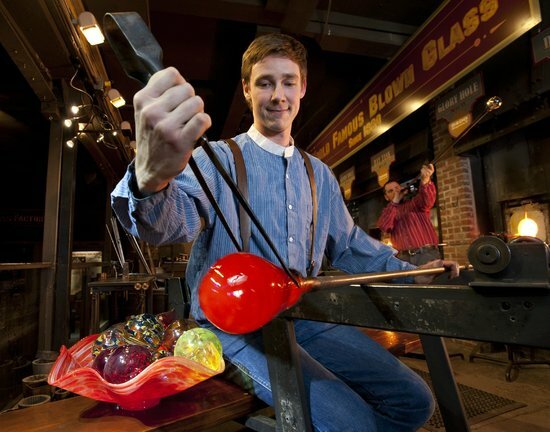 Master glass blower Shawn Watt works also as master craftsman at Hazel’s Blown & Cut Glass. As a master glass blower, Shawn transforms fire, sand and water into beautiful works of art. While still studying in high school, Shawn took a glass blowing class at a local studio and discovered a natural talent for the craft which eventually earned him a job. After he finished the course, he continued honing his skills by taking classes from craftsmen across the country and visiting glass studios all over the world. During Shawn’s first visit to Silver Dollar City in 2009, he fell in love with the place. When he first stepped into Hazel’s Blown & Cut Glass, he heard they were hiring. When he got the job, he and his wife packed up and moved from North Carolina to Branson a week later. Shawn described his excitement with his new job, "It's exciting to not only be a part of the 5000 year history of glass makers, but even more fulfilling to be a part of the rich heritage of craftsmen at Silver Dollar City. I am thrilled to collaborate with all the other crafters here." Shawn has another passion outside of art, he is experimenting a new pizza recipes for his wife and children. As a master potter at Silver Dollar City, Jeff Walker creates functional clay pots, bowls, and pie plates using his signature red glaze. Jeff had been a regular craftsman in Silver Dollar City for over 14 years. He was one of the park’s visiting craftsmen during the National Harvest Festival, before joining Hillcreek Pottery in December 2010. Jeff came from Kansas City, Missouri, where he operated his own pottery studio. Jeff came to Silver Dollar City and opened the studio five years after graduating from college and began traveling to show his work at 30 art shows a year, including Silver Dollar City’s National Harvest Festival. "Working at Silver Dollar City is an unbelievable atmosphere," says Jeff. "With such talented craftsmen there are so many different opinions and skills. Anytime I ask a question, I'm offered valuable input from a variety of mediums. It's a great learning environment." 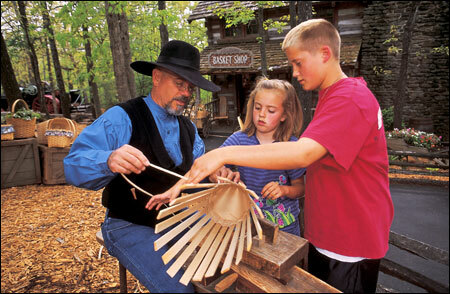 When you want to spend a great time at one of the best Branson attractions, why not visit Silver Dollar City and see craft demonstrations from different artisans.